Meet every Tuesday at 10 am for a very sociable walk. Walks are all graded from 1 the easiest to 3 the slightly more challenging and vary every week with some lasting 60 mins and others lasting as long as 1.5 hours. The group always walk to the pace of the slowest participant. These walks are totally stress free. Coffee stop en route. Please give us a try and see if we offer what you want. All walks are risk assessed and we go off in all weathers. We are a fun mixed group of ladies and gents. 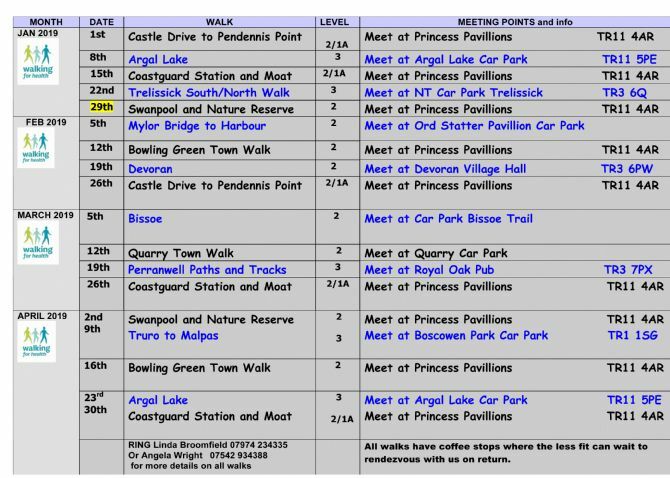 We meet at Princess Pavilions on alternate Tuesdays for a Falmouth based walk. All of the Falmouth based walks have an option for a shorter 20 - 30 minute walk if needed. The other weeks we go out and about to many different places. We have a total of 20 different walks. Please ring me on 07974 234335 or 07542 934388 for more info, anybody can come along and join in and there is no charge.